I've had this for a while now, but it was fun to get the actual piece of paper in the mail today. 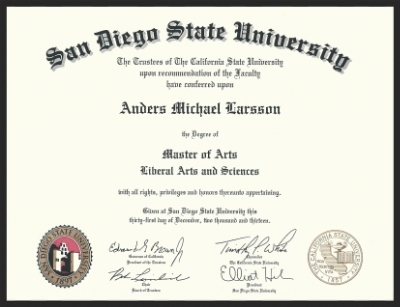 My time in the MALAS (Master of Arts in Liberal Arts and Sciences) program at San Diego State University has been invaluable. I feel strongly that Cultural Studies is one of the most exciting fields of study today. The world we live in is getting smaller -and more connected- by the atomic second, and Cultural Studies allows curious and adventurous people to connect the dots. I hope my thesis, Wax Without Honey: The LP as Post-WWII American Zeitgeist, is a good example of making connections in our complex, exciting world. Besides my usual sources of inspiration like Carl Jung, Oswald Spengler, Joseph Campbell, Marshall McLuhan, et al., the work of Dr. Emily Hicks, Dr. William Nericcio, Dr. Yetta Howard, and others deeply influenced my thinking on this work. Additionally, I'd be remiss if I didn't mention that my interaction with local musicians like Gary Wilson and El Vez weren't equally important to my thinking. Again, the MALAS journey for me was one of connection and assemblage (to borrow the language of Deleuze), and inhabiting and exploring creative moments in dive bars and venues was as important to me as the lessons in the classroom.